Back to Power Shift: Election Transitions index page. 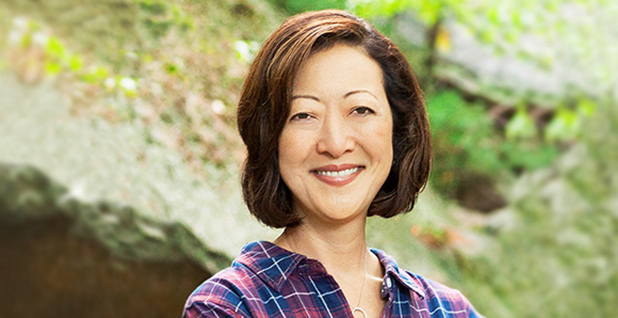 Environmental leaders like Natural Resources Defense Council President Rhea Suh are bracing for an unprecedented period of what they're characterizing as overreach under Donald Trump's administration. Photo courtesy of the NRDC. After eight years of chafing over President Obama's clean energy and climate agenda, Republicans have made clear that a top priority of the 115th Congress that kicks off this week will be rolling back the "job-killing" policies of the outgoing administration. But will the Grand Old Party go too far? With vows by President-elect Donald Trump and congressional GOP leaders to rescind the Clean Power Plan and other key regulations, as well as a Cabinet lineup that includes a nominee for U.S. EPA administrator who questions climate science and the head of the world's largest oil company as America's top diplomat, Democrats and environmentalists say there's no question that Republicans are heading for an overreach on the environment. E&E News' ongoing coverage of the new administration and the changes taking place on Capitol Hill. Click here to view the continuing coverage. "I'm not sure that they can help themselves," retiring Senate Minority Leader Harry Reid (D-Nev.) told E&E News last month (E&E Daily, Dec. 8, 2016). Environmentalists are no more optimistic. "It's the most radical approach to American governance we've seen in our lifetime," wrote Natural Resources Defense Council President Rhea Suh of Trump's Cabinet picks, in a memo distributed to reporters last month titled "The Upcoming War on Our Health and the Environment." Republicans, not surprisingly, see it differently. In interviews after Trump's surprise victory in an election in which Republicans held on to both chambers of Congress, although with slightly diminished margins, GOP lawmakers pointed to the results as validation of their view that Obama had radically pushed U.S. energy policies to the left. "I don't think Donald Trump could overreach in that regard, because it's largely why he was elected, especially in the energy patch and in the Rust Belt," said Rep. Kevin Cramer (R-N.D.), who was an early adviser to Trump on energy policy. Sen. Jim Inhofe (R-Okla.), who is stepping aside as chairman of the Environment and Public Works Committee this year because of Senate GOP term limits, also accused Obama of overreach but conceded that the upcoming rollbacks may cast Republicans and the Trump administration in a negative light. "This administration has been so extreme on one side, that no matter what happens it's going to look like the Trump administration will be extreme on the other side," he said in an interview, while pre-emptively rejecting the categorization. "We know the cost of overregulation, I knew that from the business world. Certainly Trump knows that. So I don't think that's extreme." Republicans see the upcoming push to rescind or block key environmental regulations as an appropriate response to Obama's frequent use of executive authority to circumvent the legislative branch. "There are three branches of government," incoming Senate EPW Chairman John Barrasso (R-Wyo.) told E&E News after the election. "And it seems to me that the executive branch went way overboard under President Obama, and I think it's time to get the power equally distributed again to the three branches of government." But GOP lawmakers also reject the notion that the policies of the new administration will mean the end of environmental protection. "We have an obligation to protect the environment, to make sure that our children and grandchildren have a cleaner environment than they inherited from us, but to do so in a way that doesn't destroy the economy," said Sen. Cory Gardner (R-Colo.). Sen. James Risch (R-Idaho) said Republicans continue to support clean air and clean water. "The question is how far do you go that is reasonable?" he said. "And usually tied to that is dollars and cents. So you've got to weigh these things, usually it's a balancing exercise, always, and it's no secret that a lot of people believe that this last administration's gotten us completely out of bounds." Barrasso pointed to his home state's regulation of oil and gas operations as a successful model for balancing environmental protection and economic growth. "I've spoken for years about the three E's — energy security, economic growth and environmental stewardship," he said. "And I believe Wyoming has continued to do that beautifully through the whole history of our state." But incoming House Freedom Caucus Chairman Mark Meadows (R-N.C.) noted that Trump and congressional Republicans pledged throughout the campaign to roll back Obama's environmental rules that amount to "a stranglehold on the economy." "It's incumbent for us to deliver on the promises we made on the campaign trail; anything less than that would be a dampening experience in terms of morale of members of Congress," Meadows told E&E News after the elections. Sen. Ben Cardin (D-Md. ), a senior member of EPW, said Democrats are hopeful that they can enlist some GOP support in fighting back but acknowledged the tough political road that lies ahead. "We are going to fight where we can and we are going to use every tool we can to preserve [protections], but make no mistake about it, there is going to be some damage done." Environmentalists say their efforts to fight back against environmental rollbacks will be aided by Republicans themselves, should controversial policy proposals attract widespread public scrutiny. "We expect what will happen is what has happened in the past when there's been these kind of onslaughts, although none have really equaled what the potential is now," David Goldston, director of NRDC's government affairs program, told reporters last month. "And there will be a public backlash that will leave Congress, and hopefully the administration as well, to decide to spend their political capital elsewhere." While political beliefs color opinions on what constitutes "overreach," there are historical examples of contentious environmental actions that were pulled back after public outcry. Anne Gorsuch, who was President Reagan's first EPA administrator, became embroiled in a fight with Congress in 1982 over documents related to the Superfund hazardous waste cleanup program. The House later voted her in contempt of Congress for refusing to turn over documents lawmakers were seeking, and although the Justice Department declined to prosecute, Gorsuch resigned months later after the administration relented and dropped its executive privilege claims. The controversy drew public attention to downsizing efforts at EPA implemented by Gorsuch, who like many current Republicans was a fierce believer in federalism. More bad press followed after one of Gorsuch's deputies, Rita Lavelle, was convicted of lying to Congress, fined and sentenced to prison. Reagan's controversial Interior secretary, James Watt, is another example. An avowed critic of environmentalists and unabashedly pro-resource development, he publicly pledged to "undo 50 years of bad government." Watt's 1982 plan to sell off public lands to reduce the federal deficit sparked an outcry, and he was forced to resign the following year after he bragged about the racial diversity of a federal advisory committee. "I have a black, a woman, two Jews and a cripple," Watt said after a speech at the U.S. Chamber of Commerce, according to news reports. James Goodwin, a senior policy analyst with the Center for Progressive Reform, says Trump's Cabinet nominees are similar in ideology to Reagan's EPA and Interior heads. "These are people who are openly hostile to the missions of these agencies," he said last month. "That's sort of their key qualification for their appointment for some of these positions." NRDC's Goldston sees parallels between the current political dynamic and that of 1995, when the House under then-Speaker Newt Gingrich (R-Ga.) pushed a broad rewrite of the Clean Water Act, major regulatory reform bills and more than a dozen anti-EPA riders, which played a role in a government shutdown later that year — one of two in which President Clinton stared down congressional Republicans in budget fights. "There was a fierce reaction from the public, and all of those efforts eventually foundered and the basic laws were left largely unscathed," said Goldston, who during the 1990s was a top aide to former Rep. Sherwood Boehlert (R-N.Y.), the leader of a large bloc of GOP moderates who sided with Democrats on environmental issues at the time. "We think that will happen again." Environmentalists say the expected heavy use of the Congressional Review Act to block specific environmental regulations, as well as GOP signals that broad health care and financial regulations from the Obama era are also on the chopping block, won't escape public notice. "They will actually help us build the case for overreach," Goldston said. "Going after everything I think will help make the case of just how fundamental these attacks are." Canceling the Paris climate agreement, as Trump has previously threatened, would likely serve as a wake-up call for the public, Cardin said. "I think they do so at their own peril," he said. "There is American public support for this, this is something that the international community is moving forward with, this is real." CPR's Goodwin said advocates will strive to highlight the everyday effects of proposals to repeal specific regulations as well as broader regulatory reform efforts that can slide under the public's radar (see related story). "You make it as concrete as possible," he said. Still, Republicans' hands will be tied by the Senate filibuster, a 60-vote threshold that will be that much harder to surpass given GOP losses in the Senate that leave them with 52 seats. Sen. Lamar Alexander (R-Tenn.), who has long been active on energy policy and leads the Appropriations subcommittee that funds the Energy Department, said the expected reversal of many Obama policies represents a teachable moment for both parties. "The danger in doing too much through regulations, which is what the Obama administration has done, is that can always be changed by the next administration, which this one might do," he told E&E News after the elections. "It's a good lesson in that if we want to change things here, we need to do it the hard way, which is to get consensus, and that includes Democrats and Republicans." He cited his own work on reauthorizing the No Child Left Behind education law, which he co-wrote with Sen. Patty Murray (D-Wash.) and was signed into law by Obama in 2015, as an example. "That was a hard bill to do," he said. "We should have done that on how to regulate carbon, on how to do amendments to the Clean Air Act. But instead the administration went too far with its regulations, and those can be changed by the new administration."